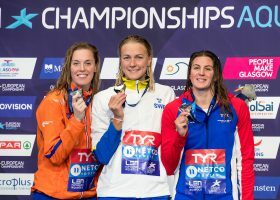 Search Results - "sarah koehler"
Two women were under the four minute marker in the final of the 400 freestyle at the 2017 European Short Course Championships. Hungarian Boglarka Kapas got her hand to the wall first. 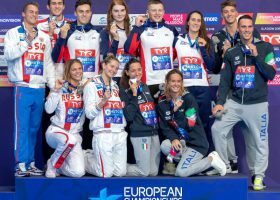 In the final individual event of the European Championships, Italy’s Simona Quadarella picked up her third gold medal of the week, winning a battle with Hungary’s Ajna Kesely in the women’s 400 free.